The highways from Carlsbad to Monahans were packed with trucks moving products associated with or derived from the oil fields, potash mines and fracking. The arid desert fields were yielding all sorts of valuable products and every mile was devoted to the serious business of extraction. Well services, pumping specialists, welders and RV lots with workers quarters rounded out the offerings in the small towns we passed. We crossed the state line from New Mexico to Texas and immediately lost an hour as we moved from mountain to central time. The state and time may have changed, but the landscape remained the same. We would have liked to travel into northern New Mexico, but we had passed the halfway point in terms of the time we had for our adventure. We would have plenty left to see for our next trip. We turned off Interstate 20 into the Monahans Sandhills State Park and entered another world. This park is a strange oasis of sand dunes. It bills itself as a family getaway where kids can saucer down the dunes on plastic discs. The discs are rented at the ranger station. Far from finding hordes of families with children clambering the dunes, we found a quiet, almost deserted campground. The campground loop boasted 24 sites, but fewer than ten were occupied. The landscape was beautiful. The mounded dunes rose and fell in undulating hills. Campsites were nestled between the dunes and neighbors were barely visible. It was warm in the sun. Close to 90 degrees, but in the shade under the shelter at our site there was a cooling breeze. We set up camp happily all the while marveling at the unexpected beauty. We hadn’t broken out our mat and chairs in Carlsbad, but now we did a full camp set up. Dakota’s tether was set so he could sit under the shelter in the shade or on the mat next to us and the trailer. We relaxed looking up at the vast blue skies with brilliant white, fluffy clouds. Jim scampered around taking pictures. We were so happy to have two nights in this amazing place. Far off to the west we noticed dark grey clouds roiling in the sky and the unmistakable trace of rain descending from the clouds. We watched with naïve enjoyment as the clouds drew closer and flashes of lightning sliced the sky in the distance. The storm was moving to the north and east and looked like it might miss us. It didn’t. Strong winds accompanied the driving rain as it hit us and we scattered to batten down chairs, the mat, put awnings away and shelter in the trailer from the driving storm. It was a big Texas storm. We had reception for one English language television station and we watched the constant weather updates to monitor the progression of two separate fronts which were colliding to form these giant storms. Red flag alerts were issued and at least one tornado touched down closer to Midland which was east of us. The weather woman, who was quite accomplished, urged everyone to seek their safe places. This storm was serious business. The storms were moving north and eastward and eventually we could see the cells had passed us. The skies had cleared and blue sky and fluffy clouds regained their hold on the horizon. “Hey, Jim, let’s take a walk around the campground loop and check out the bathhouse.” We got Dakota on his leash and headed out for a perambulation. As we walked the asphalt path, off to the west the skies dimmed again. We were only somewhat aware of this turn in the weather. Just as we reached the point in the park furthest from our Airstream, the dust storm hit. We reached the trailer as the full fury of the winds struck and Jim was almost unable to swing the trailer door shut against the blasts. The trailer rocked with the force of the winds and the dunes were whipped with lashes of sand. The television reception pixilated with the atmospheric disturbance, but the weather woman reported wind gusts from 65 to 70 miles per hour. How heavy is this trailer again? Reporting weather in a place like west Texas must be the epitome of professional satisfaction. The young and attractive woman reporting the weather on our sole television station was the center of attention and interest. She was clearly good at her job and she sure had a cornucopia of weather events to report: rain, winds, hail and tornadoes. She urged those east of us again to seek their safe place and move their cars. This was clearly a familiar drill. We quelled our nervousness watching the Spanish language broadcast of the Trinidad and Tobago vs. Mexico football match. Mexico won by a goal, one nil. Eventually the winds subsided. Jim broke out his ancient iPod and we listened to The Dixie Chicks and read until bedtime. The peaceful evening was a marked contrast to the maelstrom which preceded it. Wonder what tomorrow will bring? The next morning heated up quickly. It was easily 90 degrees in mid-morning. The wind was still blowing strongly and periodically grey clouds would skid across the sky. We were still feeling a little undone by the previous night’s weather events. We stopped by the ranger station to see their exhibit on the sand dunes and the nature trail and ended up in a long chat with the ranger on duty who explained a bit about the back story of this amazing stretch of sand dunes. Mr. T (Tavares) demurred he was not an interpretive ranger, but he had a pretty excellent way of explaining this remarkable landscape. He said that over 10,000 years ago, this approximately 30 mile wide swath of sand was created when sands from the exposed flood plains of the Pecos River were blown and deposited against the Caprock Escarpment. The winds had formed a river of sand. His example of the ecosystem of the dunes employed a sponge analogy. The water table in the sponge (dunes) was what held the sand pretty much in place. Sometimes the water table was higher and sometimes lower and when it was lower the sands would shift, but they would never completely blow away or disappear because the water table held them in place. Also helping to hold the dunes in place is the vegetation. Because the water table varies, the scrubby trees which cover the dunes extend their roots up to 150 feet into the sand. Their roots anchor the dunes. Honey mesquite and havard shin oaks are found all over the park. The havard oaks actually look like bushes, but they are actually small trees. Mr. T. said that before Katrina, the park had gone through a 15 year drought. The water table had dropped year after year. In the wake of Katrina over 50 inches of rain fell replenishing the water table. That fall the dunes were covered in brilliant carpets of wild flowers. It was magnificent and ironic since that same weather event had also caused such destruction and damage elsewhere. We really enjoyed our time with the ranger and left with a much better understanding of this remarkable environment. Of course, our last morning dawned cool and sunny. It was just as delightful as that first afternoon had been when we had expectantly deployed our mat and chairs only to be assailed by Mother Nature. It was time to hitch up. Our mat was still buried in sand where the wind had tossed it against the trailer. The chairs were covered by sand as was Dakota’s tether. The Airstream was streaked and dirty from the lashing of the rain and sand. As we headed to Aiken, the sun came out, the snow and ice disappeared and we could shed a few layers. It felt so good to be warm again. The sun felt warm on our faces. Having had a few bumps in the road so to speak, Aiken State Park was our first real opportunity to settle in a bit. We were the only campers there. Besides the rangers and the campground host, we had the whole park to ourselves. It was a beautiful park. Our site was a back-in and Jim handled it perfectly. We were so incredibly happy and, even without water yet, I cooked a lovely dinner and we enjoyed the quiet and serenity. Looking out the windows there was lush green vegetation in all directions. On day two Jim decided to try to de-winterize the unit. This was not a completely successful undertaking. Rather than discover the expected pink anti-freeze, when we began to operate the system, the toilet began leaking and we deduced that somehow the Airstream had not been properly winterized. That odd leak we experienced back in December took on new meaning and we realized it was the result of the toilet valve bursting. Oops. Clever as he is, Jim figured out how to get most of the system in operating order, we just didn’t have use of the toilet. Good enough for me, I could finally wash dishes in the sink rather than a bucket. It may not have been perfect, but we were reveling in what we had. I even took a shower in our own shower! I had always been fascinated with Aiken, SC. Ever since reading On a Street Called Easy, in a Cottage Called Joye by Gregory White Smith and Steven Naifeh, I had wanted to visit Aiken. It sounded like a fabulous place. I loved that book for all its romance and the idea of chucking it all and making a new life. Somehow that resonated with me. Aiken is big horse country. The roads around Aiken are lined with horse farms. Huge fenced paddocks and wide fields are dotted with long-limbed horses. Every other field hosts an assortment of jumps including cross-country fences. Every house features a horse trailer. It would seem naked without it. We were very happily enjoying our stay in Aiken and now we had a social opportunity as well. My former colleague, Robert, and his husband, Milton, had retired to Aiken two years ago. I am not sure Robert ever expected us to drop by, but we had kept in touch and, please note, giving me your contact information can be dangerous. We arranged to have coffee our second morning in Aiken. We had a delightful visit with Robert and Milton, saw their beautiful home and met their dogs, Lucas and Shorty. It was great fun. 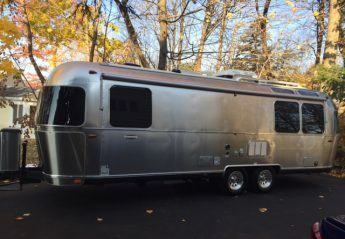 We tentatively made plans to have drinks and possibly dinner that night, but the sometimes capricious hand of Airstream life intervened. Our disappointment at missing Atlanta and the Atlanta Frosts was balanced by our relief. Just between us, we believe one of the people we talked to during the day called the first guy up and told him to help us out. They all knew each other. No matter. However it happened, we were thrilled! Ironically, I never did see Aiken, the town. This is fair warning to Robert and Milton that we will be back someday!